When it comes to getting news about politics and government, liberals and conservatives inhabit different worlds. There is little overlap in the news sources they turn to and trust. And whether discussing politics online or with friends, they are more likely than others to interact with like-minded individuals, according to a new Pew Research Center study. The project – part of a year-long effort to shed light on political polarization in America – looks at the ways people get information about government and politics in three different settings: the news media, social media and the way people talk about politics with friends and family. In all three areas, the study finds that those with the most consistent ideological views on the left and right have information streams that are distinct from those of individuals with more mixed political views – and very distinct from each other. These cleavages can be overstated. The study also suggests that in America today, it is virtually impossible to live in an ideological bubble. Most Americans rely on an array of outlets – with varying audience profiles – for political news. And many consistent conservatives and liberals hear dissenting political views in their everyday lives. Yet as our major report on political polarization found, those at both the left and right ends of the spectrum, who together comprise about 20% of the public overall, have a greater impact on the political process than do those with more mixed ideological views. They are the most likely to vote, donate to campaigns and participate directly in politics. The five ideological groups in this analysis (consistent liberals, mostly liberals, mixed, mostly conservatives and consistent conservatives) are based on responses to 10 questions about a range of political values. That those who express consistently conservative or consistently liberal opinions have different ways of informing themselves about politics and government is not surprising. But the depth of these divisions – and the differences between those who have strong ideological views and those who do not – are striking. Are tightly clustered around a single news source, far more than any other group in the survey, with 47% citing Fox News as their main source for news about government and politics. Express greater distrust than trust of 24 of the 36 news sources measured in the survey. At the same time, fully 88% of consistent conservatives trust Fox News. Are, when on Facebook, more likely than those in other ideological groups to hear political opinions that are in line with their own views. Are more likely to have friends who share their own political views. Two-thirds (66%) say most of their close friends share their views on government and politics. Are less unified in their media loyalty; they rely on a greater range of news outlets, including some – like NPR and the New York Times– that others use far less. Express more trust than distrust of 28 of the 36 news outlets in the survey. NPR, PBS and the BBC are the most trusted news sources for consistent liberals. Are more likely than those in other ideological groups to block or “defriend” someone on a social network – as well as to end a personal friendship – because of politics. Are more likely to follow issue-based groups, rather than political parties or candidates, in their Facebook feeds. Those with down-the-line conservative and liberal views do share some common ground; they are much more likely than others to closely follow government and political news. This carries over to their discussions of politics and government. Nearly four-in-ten consistent conservatives (39%) and 30% of consistent liberals tend to drive political discussions – that is, they talk about politics often, say others tend to turn to them for information rather than the reverse, and describe themselves as leaders rather than listeners in these kinds of conversations. Among those with mixed ideological views, just 12% play a similar role. Throughout this report we utilize a scale composed of 10 questions asked on Pew Research Center surveys going back to 1994 to gauge people’s ideological worldviews. The questions cover a range of political values including attitudes about size and scope of government, the social safety net, immigration, homosexuality, business, the environment, foreign policy and racial discrimination. The scale is designed to gauge the extent to which people offer liberal or conservative views across these various dimensions of political thinking (what some refer to as ideological ‘constraint’). Where people fall on this scale does not always align with whether they think of themselves as liberal, moderate or conservative. Respondents answered these questions on an earlier survey, the basis for the Pew Research Center’s June 2014 report on Political Polarization in the American Public. The full details about this scale can be found in Appendix A of that report. Earlier this year, the Pew Research Center released a major analysis of changes in the American electorate titled Political Polarization in the American Public. The study, based on interviews with more than 10,000 adults nationwide, tracked the growing ideological consistency and partisan antipathy expressed by Americans, and how these views correlate with people’s willingness to compromise, relationships with friends and family, and even preferences about where to live. This report is based on a follow-up survey, about where people get political news and information, conducted among the 88% of panel members with online access. While the picture drawn might be slightly different if those without internet access had been included, this report provides a thorough look at political information consumption by the large online population. It is important to note, though, that those at either end of the ideological spectrum are not isolated from dissenting views about politics. Nearly half (47%) of across-the-board conservatives – and 59% of across-the-board liberals – say they at least sometimes disagree with one of their closest political discussion partners. For those closer to the middle of the ideological spectrum, learning about politics, or discussing it with friends and family, is a less of a focus. When they do follow politics, their main news sources include CNN, local TV and Fox News, along with Yahoo News and Google News, which aggregate stories from a wide assortment of outlets; these U.S. adults see more of a mix of views in social media and are less likely to be aware of their friends’political leanings. This study, the latest in a series of reports on political polarization, is based on an online survey conducted March 19-April 29, 2014 with 2,901 members of the Pew Research Center’s new American Trends Panel — a panel recruited from a telephone survey of 10,013 adults conducted earlier this year. When it comes to choosing a media source for political news, conservatives orient strongly around Fox News. Nearly half of consistent conservatives (47%) name it as their main source for government and political news, as do almost a third (31%) of those with mostly conservative views. No other sources come close. Consistent liberals, on the other hand, volunteer a wider range of main sources for political news – no source is named by more than 15% of consistent liberals and 20% of those who are mostly liberal. Still, consistent liberals are more than twice as likely as web-using adults overall to name NPR (13% vs. 5%), MSNBC (12% vs. 4%) and the New York Times (10% vs. 3%) as their top source for political news. Among the large group of respondents with mixed ideological views, CNN (20%) and local TV (16%) are top sources; Fox News (8%), Yahoo News (7%) and Google News (6%) round out their top five sources. At least as important as where people turn for news is whose news they trust. And here, the ideological differences are especially stark. Respondents were asked whether they had heard of each of the 36 outlets listed in the accompanying graphic. For those they had heard of, they were asked about their trust – or distrust – in each source. 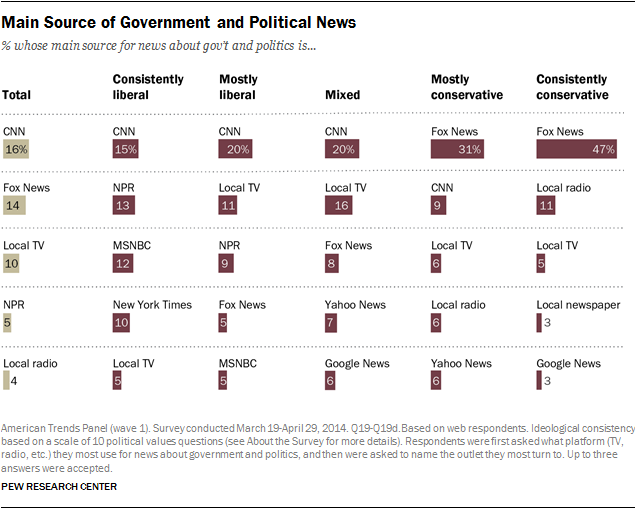 Liberals, overall, trust a much larger mix of news outlets than others do. Of the 36 different outlets considered, 28 are more trusted than distrusted by consistent liberals. Just eight earn higher shares of distrust than trust. Still, among those eight, the levels of distrust can be high: fully 81% of consistent liberals distrust Fox News, and 75% distrust the Rush Limbaugh Show. Among consistent conservatives, by contrast, there are 24 sources that draw more distrust than trust. The same is true for 15 sources among those with mostly conservative views. 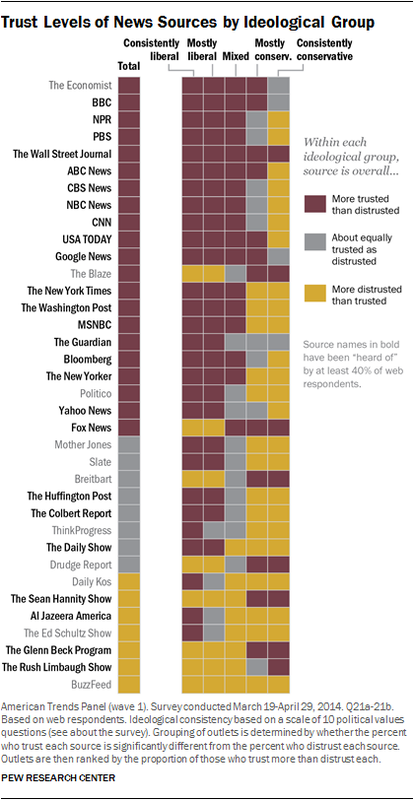 And, of the eight outlets more trusted than distrusted by consistent conservatives, all but one, on balance, are distrusted by consistent liberals. Also at play here is the degree to which people are more familiar with certain news sources than others. Some outlets such as CNN, ABC News and Fox News, are recognized by at least nine-in-ten respondents, meaning that more respondents offer a view of these outlets one way or the other. Outlets currently occupying more niche markets, such as Politico, the Economist or BuzzFeed, are known by only about a third of respondents. Thus, while they may elicit strong views in one direction, the share of respondents weighing in is relatively small. This section of the report looks in detail at news audiences and trust and distrust of outlets across ideological groups. For more on how the news sources were selected, see Appendix B. In the growing social media space, most users encounter a mix of political views. But consistent conservatives are twice as likely as the typical Facebook user to see political opinions on Facebook that are mostly in line with their own views (47% vs. 23%). Consistent liberals, on average, hear a somewhat wider range of views than consistent conservatives – about a third (32%) mainly see posts in line with their own opinions. But that doesn’t mean consistent liberals necessarily embrace contrasting views. Roughly four-in-ten consistent liberals on Facebook (44%) say they have blocked or defriended someone on social media because they disagreed with something that person posted about politics. This compares with 31% of consistent conservatives and just 26% of all Facebook users who have done the same. Consistent liberals who pay attention to politics on Facebook are also more likely than others to “like” or follow issue-based groups: 60% do this, compared with 46% of consistent conservatives and just a third (33%) of those with mixed views. And both the left and the right are more likely than others to follow political parties or elected officials: 49% of consistent conservatives and 42% of consistent liberals do so, compared with 29% of Facebook users overall. In personal conversations about politics, those on the right and left are more likely to largely hear views in line with their own thinking. While only a quarter (25%) of respondents with mixed ideological views say most of their close friends share their own political views, that is true of roughly half (52%) of consistent liberals and two-thirds (66%) of consistent conservatives. And, when those who talk about politics are asked to name up to three people they most often talk to about politics, half (50%) of consistent conservatives name only individuals they describe as also being conservative – outpacing the 31% of consistent liberals who name only liberals. 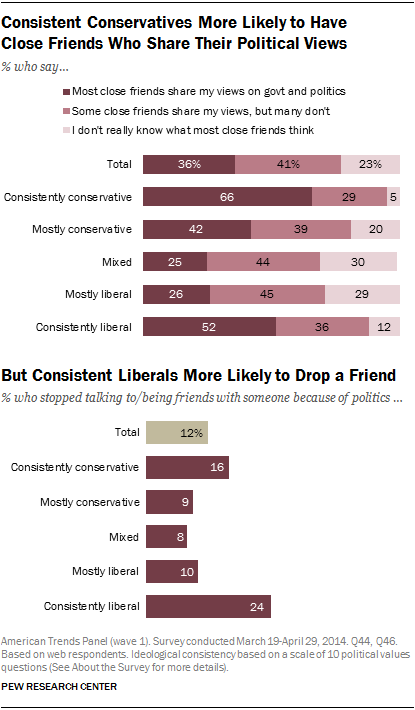 At the same time, consistent liberals are more likely to stop talking to someone because of politics. Roughly a quarter (24%) have done so, compared with 16% of consistent conservatives and around 10% of those with more mixed political views. Still, a solid portion of even the most ideologically-aligned respondents encounter some political disagreement with their close discussion partners. Nearly half (47%) of consistent conservatives who talk about politics name one or more discussion partners with whom they disagree at least some of the time. This figure rises to more than half (59%) of consistent liberals and even larger shares of those with mostly liberal and ideologically-mixed political views (79% each). 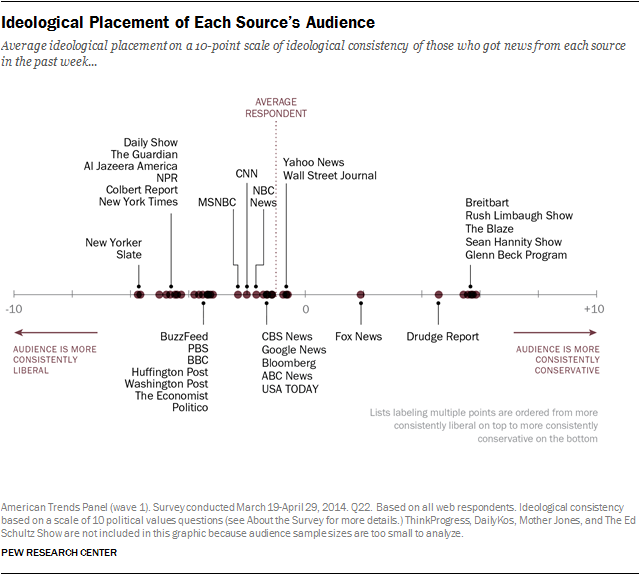 Ideological differences in media source preferences result in distinct audience profiles for many media outlets. Many sources, such as the Wall Street Journal, USA TODAY, ABC News, CBS News and NBC News have audiences that are, on average, ideologically similar to the average web respondent. Reflecting liberals’ use of a greater number of media sources, there are more outlets whose readers, watchers and listeners fall to the left of the average web respondent than to the right. At the same time, a handful of outlets have audiences that are more conservative than the average respondent. Fox News sits to the right of the midpoint, but is not nearly as far right as several other sources, such as the radio shows of Rush Limbaugh or Glenn Beck. A closer look at the audience breakdowns reveals why: While consistent conservatives get news from Fox News at very high rates, many of those with less conservative views also use Fox News. By contrast, the audiences for Limbaugh and Beck are overwhelmingly conservative. By comparison, the average consumer of the Wall Street Journal sits very close to the typical survey respondent, but the range of Journal readers is far broader because it appeals to people on both the left and the right. As a result, while respondents overall cluster toward the center of the ideological spectrum, the Journal’s audience is relatively evenly distributed across the continuum: 20% are consistent liberals, 21% mostly liberal, 24% mixed, 22% mostly conservative and 13% consistent conservative. For a more detailed look at the ideological composition of each source’s audience, see the Pew Research Center’s interactive database.